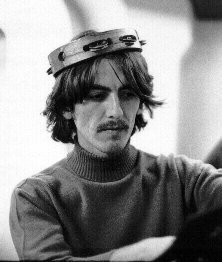 George Harrison was born February 25, 1943, making him the youngest Beatle. The only Beatle who's childhood was not marred by divorce or death, he had two brothers, Harold Jr. and Peter, and a sister, Louise. His father, Harold, was a bus driver, and his mother a housewife, who all the kids in the neighborhood knew and liked. George attended Dovedale Primary school, two forms behind John Lennon, and then Liverpool Institute, one form below Paul McCartney. He showed his independant nature at an early age, defying his school's age-old dress code by wearing jeans and growing long hair. His strict parents did not condone his disrespectful attitude and George soon learned to tone down his rebellion. When the skiffle craze hit Liverpool, George and his brother Peter formed a Skiffle band, but because they were so young, they had to sneak out of the house to play their first engagement. George and Paul took the same bus to school, and soon found they had music and guitars in common. They spent many hours together at each other's homes practicing guitar. In 1956, Paul introduced the skinny and pimple-faced George to the Quarrymen, who was only 14 at the time. Not old enough to join the group, George hung around with the boys, and came to idolize John, doing everything he could to emulate him. George stood in the back of the room at all their shows with his guitar. A few times he filled in for the regular guitarist who didn't show up, and the boys were also welcomed in George's house by his mother to practice and for an occasional "jam buttie", encouragement which infuriated John's Aunt Mimi. Gradually, George became a member of the group, which by then had come to be called Johnny and the Moondogs. From the very start of the Beatles' popularity, George was as major a vocalist as John and Paul. As the songwriting of Lennon and McCartney became world-known, George started to concentrate more on writing songs as well, although many of the early songs written while with the Beatles went unrecorded. The first Beatles song written by George was Don't Bother Me. 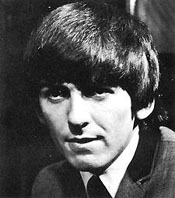 George became a very serious musician who worked dilgently to perfect his playing. His concentration to his playing was apparent while on stage, especially compared to the wild antics of John and Paul George almost missed the Beatles' biggest appearance in America, the Ed Sullivan Show, on February 9, 1964, because of a sore throat. He met teenage model Patty Boyd while filming A Hard Day's Night and they got married on January 21, 1966. Though McCartney and John Lennon initially wrote nearly all of the Beatles' material, by 1966 Harrison was contributing a song or two per album, including hits like "Taxman," "While My Guitar Gently Weeps" and "Here Comes the Sun." Harrison also became fascinated with sitar music (inspired by his interest in Hinduism), and later received instruction from acclaimed sitar composer Ravi Shankar, whose music he helped to popularize in the West. Harrison contributed some sitar-based songs to the 1968 film soundtrack Wonderwall Music, the first solo outing by a Beatles member. By the time the Beatles recorded The Beatles (aka The White Album) in 1968, Harrison was often at odds with McCartney and Lennon over whose songs would be developed and recorded by the band. The guitarist's personal life was also troubled: he and close friend Eric Clapton both loved the same woman, Patti Boyd, who was married to Harrison yet spent much of her time with Clapton. Boyd later switched husbands, but the three remained eerily close. Following the release of Abbey Road in the fall of 1969, Harrison traveled to Europe to perform with Delaney and Bonnie and Friends,a group which included his old friend, keyboardist Billy Preston. Within months the Beatles were no more. Harrison's first post-Beatles album was All Things Must Pass, released in late 1970. Recorded with Phil Spector and featuring appearances by old friends Eric Clapton, Klaus Voormann and Ringo Starr, the triple album became a No. 1 hit, spawning the No. 1 single "My Sweet Lord." Unfortunately for Harrison, "My Sweet Lord" bore a strong resemblance to the Chiffons 1962 hit "He's So Fine," and the Chiffons' publishing company filed suit seeking damages for the alleged plagiarism. After protracted negotiations failed, a court finally heard the case in 1976, and quickly ruled that Harrison had "subconsciously" borrowed from "He's So Fine" and owed $1.6 million in damages. Due to complicated business and legal issues involving Apple Music (the Beatles' label, which also released Harrison's early solo albums), the Chiffons' publisher, and former Beatles manager Allen Klein, the case was not settled until the 1990s. Harrison took a break from recording in 1971, producing an album for Badfinger (the first band signed to Apple Records), contributing to John Lennon's Imagine, and performing at a landmark 1971 benefit for the troubled Asian nation of Bangladesh (later commemorated in a triple live album). Harrison returned to solo work with his 1973 album Living in the Material World, featuring the No. 1 hit "Give Me Love (Give Me Peace on Earth)." The hastily recorded 1974 album Dark Horse was followed by Harrison's first North American solo tour, yet his following was already beginning to diminish. 1975's Extra Texture was a flop, and ended his career with EMI, the Beatles' old label. Harrison rebounded by forming Dark Horse Records, his own imprint, which was affiliated with A&M Records. He released 33 & 1/3, his most praised album since All Things Must Pass. Unfortunately this comeback was short-lived: his 1979 eponymous album was another artistic disaster. 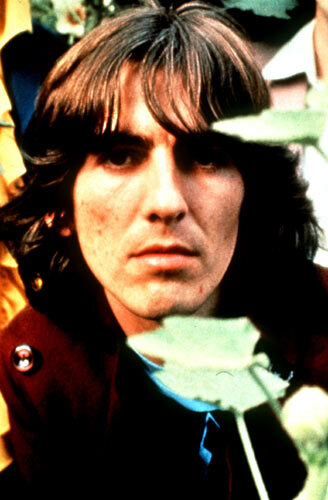 Harrison's next album, Somewhere In England, was rejected by Warner Bros. (Dark Horse's new distributor), but following John Lennon's 1980 assassination, the album was reworked to capitalize on a resurgence of Beatles nostalgia. The new Somewhere in England contained the hit song "All Those Years Ago," featuring Paul McCartney and Ringo Starr, and quickly rose in the charts. Though Harrison's solo albums were often of disputed artistic quality, throughout the 1970s they sold acceptably. This came to an end in 1982 with Gone Troppo, a complete commercial failure. Harrison wisely decided to take time off from his musical career to concentrate on producing movies and racing his large collection of sports cars. He founded HandMade Films in 1978, and used the company to produce such classics as Monty Python's Life of Brian and the 1980 adventure Time Bandits.Though he contributed a few songs to the 1985 Porky's Revenge soundtrack, Harrison's serious return to music was 1987's Cloud Nine, the biggest selling album of his solo career. Produced by former ELO frontman Jeff Lynne, Cloud Nine was Harrison's most slick, pop-oriented album yet; its cover of the Rudy Clark song "I Got My Mind Set On You" became a No. 1 radio hit. The following year, along with Lynne, Harrison formed the Traveling Wilburys with rock star pals Tom Petty, Bob Dylan and Roy Orbison. The supergroup released two platinum-selling albums, 1988's Traveling Wilburys and 1990's Traveling Wilburys, Vol. 3 [sic] before going on hiatus. Harrison returned to solo touring in 1991, accompanied by his old friend Eric Clapton; the world tour was commemorated in the 1992 album Live in Japan. Returning to England, Harrison quickly signed on to a planned BBC Beatles documentary, which eventually led to two "new" Beatles songs ("Free as a Bird" and "Real Love") created by matching new music performed by Harrison, McCartney and Starr to late '70s Lennon home demos. Harrison remained strangely silent following the massive commercial success of the 1995-6 Beatles Anthology series. Three years later, he was again in the news under unfortunate circumstances when a man broke into his mansion outside of London and attacked him and his wife. Harrison was stabbed several times, though he made a full recovery. The intruder was later found not guilty by reason of insanity. In 2000, Harrison began work on a new album, slated for release in 2001. The same year, Capitol released a 30th anniversary edition of the landmark All Things Must Pass, which included a re-recorded version of the hit "My Sweet Lord." Harrison died at the age of 58 on Nov. 29, 2001, following a long battle with cancer. He is survived by his wife, Olivia Arias Harrison, and his son Dhani.